Just when you think you have your newborn all sussed out – they go and become a three-month-old baby (they’re cheeky like that). 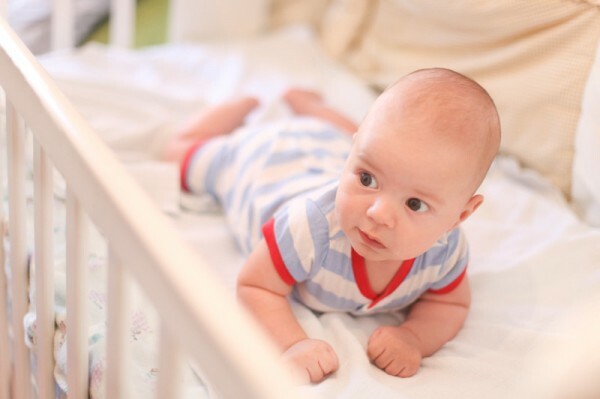 Whether it happens gradually, or seemingly overnight, around this time you may notice a big shift in your baby’s sleep. Here are a few signs that your little one is about to change sleep routines. At around the three-month mark, there’s the possibility your baby will enter what’s sometimes called a ‘sleep regression’ phase. This is a somewhat misleading term, as your baby is actually advancing, rather than regressing. If you’ve previously been able to put your baby to bed asleep without them waking, this may change. That’s because when a newborn first falls asleep, they’re in a deep sleep. This isn’t the same for older babies, who may wake in those early sleep stages. Your baby starts developing new skills (some babies can roll as early as three months) and would prefer to practise these (including chatting), rather than sleep. They’re generally more alert to everything happening around them – they want to look at/taste everything! It can get quite difficult for your baby to become calm enough to sleep. They may begin having separation anxiety during the day, and this can also extend into the night. Keep a consistent bedtime routine. This might include some quiet time, bath and a book. You can even try extending the length of the quiet time, to give your baby extra time to settle. Ensure their nursery is still suited to sleep – especially that as much as possible it’s free of distractions and bright lights. If your baby hasn’t yet started rolling, you can keep swaddling, and for many babies, this will do the trick. Keep an eye on your baby’s tired signs, rather than watching the clock. If your baby is showing tell-tale signs like rubbing their eyes or jerky movements, but it’s not yet bedtime, start your sleep routine early. Remember that between three and six months, babies get tired during the day after being awake for about one to one and a half hours. So make sure they’re taking appropriate daytime naps. As with most information about babies, one size doesn’t fit all when it comes to sleep. Make sure you talk to your health care provider about any concerns you have about your baby’s sleep (or lack thereof! ).